Surf Sizes One size fits all When you just need that little bit extra to keep you on your board. The LF surf strap will do the trick. Multiple hole adjustment to accommodate any foot size and any desired feel. ... webbing and neoprene base. Easy strap adjustment for different size feet. Multiple attachment point system. 4 footstraps per package. Footstraps come in pairs. 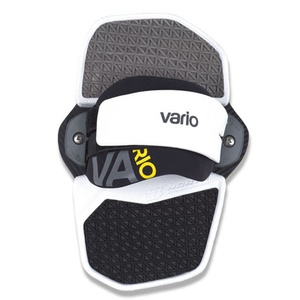 They consist of adjustable straps, sometimes mounted on a pad, designed to secure a windsurfer's or kitesurfer's feet to the board. These devices are used by windsurf and kitesurf enthusiasts from beginners to experienced competitors. Standard models consist of a single strap, generally neoprene, that screws onto the board. The strap is adjustable, often via a Velcro closure. Pad models, more sophisticated, are found mostly on kitesurf boards. Their wide base clips or screws onto special fitting on the board. They offer the advantage of greater foot comfort since variable rigidity can allow them to mold to the shape of the arch. Most footstraps can be used with any board. However, some pad models can be mounted only on boards designed to hold them. Choice also will depend on sole hardness, strap adjustment range and comfort, as well as maximum size.